I’m glad we’re setting up a blog for Rincon-Vitova Insectaries, Inc., sharing what we have learned about biological pest control. I want to launch with a post about my dad, Everett J. “Deke” Dietrick, and the circumstances that led him to go into this business. Rincon-Vitova was always out there, promoting non-chemical methods while every other organization tried to suppress the same knowledge in order to survive. My father said, “You couldn’t get it anywhere else” referring to the field observations and successful experiences of Rincon-Vitova’s pioneering “supervised control” consultants. Following his inspiration and his open-door policy, national and commercial insectaries were built from Mexico to Pakistan to the former Soviet Union. Today Deke is grateful to see the expanding interest in biological methods. The Association of Natural Bio-Control Producers honored him in 2005 for outstanding contributions to commercial biological control. 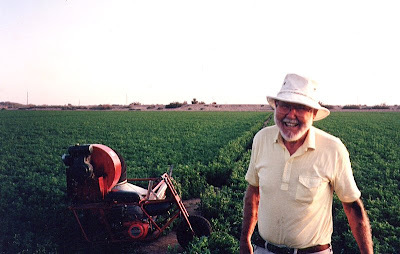 Watching my father at work on so many fronts while I was growing up, I understood his mission to show farmers how to control pests without poisons and nothing seemed more meaningful for me than helping him. I am so grateful to be doing what I can to expand and extend his legacy.